(Description as found on the BBC website) Billie Holiday was a jazz diva who became the stereotypical victim - unlucky in life, unlucky in love and dead from drink and drugs at the age of only 44. 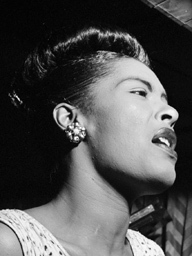 Reputations re-examines Billie Holiday's life and career. Was life hard on Billie, or was she always a tragedy waiting to happen? Holiday was born in Baltimore in 1915, the illegitimate daughter of a 16-year-old jazz musician and an 18-year-old cleaner. She was raped by a neighbour at the age of 11, and began work as a prostitute in Harlem at the age of 14. However, she was already listening to jazz – Louis Armstrong records on a wind-up Victrola – and started to think about a career which would take her out of the brothel where she worked. She began singing in Harlem’s night spots and was soon noticed as something different. She cut her first record at the age of 18 and, by the time she was 23, she had recorded with most of the great names in jazz - including Duke Ellington, Count Basie and Artie Shaw. Billie lived it up with a vengeance, and had a huge appetite for drink, drugs, men and women. She had an affair with actor and director Orson Welles, and also had a number of lesbian affairs - including one with Tallulah Bankhead. By the late 1930s she had married small-time drugs dealer Jimmy Monroe, who introduced her to opium and heroin. This was the beginning of Billie’s downfall. In 1947, she was imprisoned for a year for possession of drugs. On her release she had difficulty finding work and there was a succession of relationships with violent, parasitic men and a decline into addiction - accompanied by a roughening of her voice and an alarming physical decline. On 10 July 1959, Billie Holiday died in hospital in New York of cirrhosis of the liver. In a characteristically cruel twist she had been arrested on her deathbed for possession of narcotics, and spent most of her final days under police guard. Reputations includes interviews with many of the people who knew Billie best - including Bobby Tucker, who played piano for her and visited her in prison, William Duffdey, who co-wrote Billie’s autobiography, and close friend Annie Ross. Writers Maya Angelou and Alice Walker talk of their respect for her. The film also includes rare footage of Billie Holiday in performance, some of it unseen for nearly 50 years. These add up to a portrait that looks beyond the legend of Billie as the stereotypical victim. Instead, the programme reveals a determined woman with a great appetite for life, who lived it on her terms.